The OnePlus X packs a 5-inch AMOLED display, which is a great treat for such an affordable mid-ranger. It's a high-quality panel of 1080p resolution, which delivers 441ppi of pixel density. While not record-breaking numbers, individual pixels are nonetheless indistinguishable to the naked eye and so is the Diamond PenTile matrix. You're not going to see pixels on this screen and thanks to the AMOLED tech that's built-in, the panel enjoys inky-deep blacks and unmatched vividness to colors. When it comes to maximum brightness, the OnePlus X wouldn't go as high as some other AMOLED phones but it's quite alright and only flagship segment phones do better. It's actually around the same level as the HTC One A9 and this one while not being very bright to begin with, has twice the price tag. The minimum brightness on the OnePlus X is only 3.3nits, which is to say that using it in dimly lit environments will be easy on your eyes. AMOLED has inherently superb viewing angles and those of the OnePlus X don't disappoint. The panel retains its contrast and colors even in extreme angles and is one of the least reflective screens we've ever tested. However the AMOLED on the HTC One A9 and Samsung's own Super AMOLED found in the Galaxy Note 4, Note5 and Galaxy S6 line easily top the OnePlus X's display in outdoor performance (though these are a lot more expensive phones to begin with). Usually makers skimp on some of the essentials when building a lower-cost smartphone and many times the display is the first compromise. Luckily OnePlus didn't compromise with the X's display, which delivers on all points except its brightness, which is still acceptable. More importantly the 5" display is sharp and a joy to consume media on. 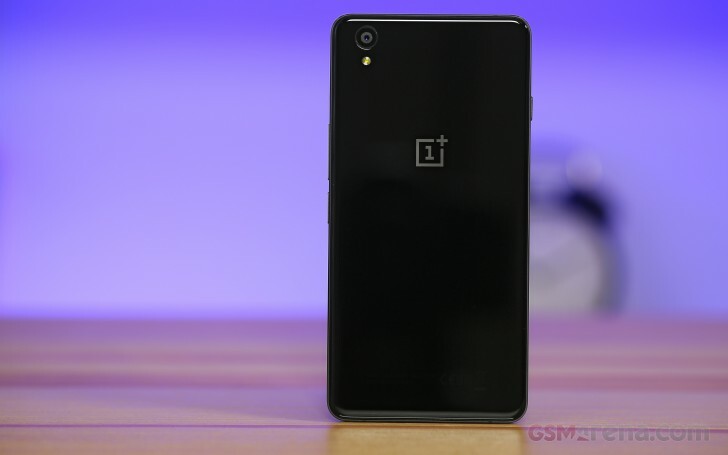 The OnePlus X packs a non-removable 2,525mAh battery, which is about average capacity for a 5-inch 1080p smartphone. The Oppo R7 has a 2,320mAh cell, the recently reviewed HTC One A9 with its 2,150mAh is noticeably underpowered compared to OnePlus' model, while the Xiaomi Mi 4c has a generous 3,080mAh battery. The slightly larger 5.2-inch Nexus 5X has a, well, slightly larger 2,700mAh powerpack. The OnePlus X didn't prove as a miracle worker and pairing an average capacity with an older chipset yields unimpressive results. While 16 hours of call times is a good performance, short of 7 hours in the video playback test and even less in web browsing are not numbers anyone would be happy with. It's the frugal standby power consumption (which we measure, but don't include in the scorecard) that saves the OnePlus X and helps it achieve its 54-hour endurance rating in our proprietary test. The Xiaomi Mi 4c outlasts the OnePlus X in all three disciplines, which measure actual usage. And it's not a marginal difference - more than 3 hours in each test, though it's let down by less than optimal standby performance. The Oppo R7 is ahead in all three tests as well, but also in overall rating, despite its lower capacity. The HTC One A9 on the other hand is trailing last in this group. Thanks to the on-board modem of the Snapdragon 801 chipset, the OnePlus X supports lots of LTE bands and covers the specs for LTE Cat. 4 (up to 150Mbps downlink, up to 50Mbps uplink). It also offers quad-band GSM connectivity and quad or penta-band (market dependent) 3G connectivity with HSPA support. The rest of the wireless connectivity features include Wi-Fi b/g/n support and Wi-Fi Direct. There is no dual-band Wi-Fi support, unfortunately. There is also support for Bluetooth 4.0, GPS and GLONASS, plus an FM radio. Wireless screen mirroring is available via the Miracast protocol. NFC is not available though.